With the collaboration of Jumeirah and the wild life protection office a humble project by the name of Dubai Turtle Rehabilitation project was initialized in the year 2004. With the perfect veteran support and medical assistance the team of Turtle Rehabilitation project’s actual aim is to help sick and injured turtles, so that they can get well as soon and return to their natural habitat. Appropriate treatments are provided to the turtles, besides that, the issue behind their weak health and danger living is raised. If you find any turtle that is in danger then do coordinate with them. Critically endangered species of turtles are given special attention and primary care is administrated to the ones that are ill. 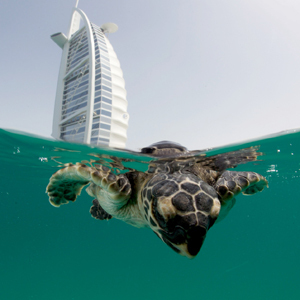 Under the observation of veterinarians they are returned to the Burj Al Arab Aquarium. If needed, few turtles are even given proper medication along with surgery administration. 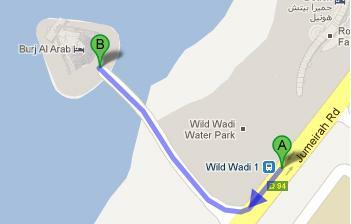 600 meters away from Burj Al Arab, Wild Wadi 1 bus stop is located. 7 minutes walk is required to cover the required distance. Routes that make a stop at the Wild Wadi 1 are 8 from Ibn Battuta Metro Station 1, 88 from Nakheel Metro Station Seaside and X28 from Nakheel Metro Station Seaside. After getting off the bus head southwest on the Jumeirah Rd/D 94 and then take a slight right turn. After covering 450 meters distance you will reach at your destination. For a detail view of the map Click Here!